Touring through Italy? Pointing the car to wherever it may go as you explore the regions of Tuscany and Umbria? A fabulous stopping point between Rome and Florence is in the Umbria region and it’s lovingly known as the enchanting town of Todi. Do you remember when those first Visa commercials came out? Airline tickets $600, Rental car $200, exploring the Italian countryside? Priceless. The picturesque hill town, all lit up and inviting in the original commercials was the town of Todi. The town offers relaxation second to none as you tour through the countryside. The central square of the town is known as Piazza del Popolo and is a fantastic spot to simply sit, enjoy a glass of chianti and some wonderful pappardelle pasta. Bordering the square are many venues to explore including an old tower, an ancient cathedral and La Rocca castle. Do not miss the exquisite stained glass windows or you’ll kick yourself later. During my own visit to Todi, I stayed outside of town in a small house attached to a larger estate. I found the lodgings on www.cuendet.com and paid a small pittance for seven days that was less than a week’s stay in many hotels. The estate was extensive, and it felt like the rest of the world had ceased to exist. The Tuscan countryside lifestyle was an easy one to immerse in, without a worry in the world. Many bottles of wine and a variety of good books were consumed during the stay. For those wanting to truly get the feel of Todi as a town and immerse yourself in its culture, I would recommend staying in town. There are numerous accommodations that are first rate. Todi is a perfect spot to centralize yourself at if day-trips throughout the region are your desire. 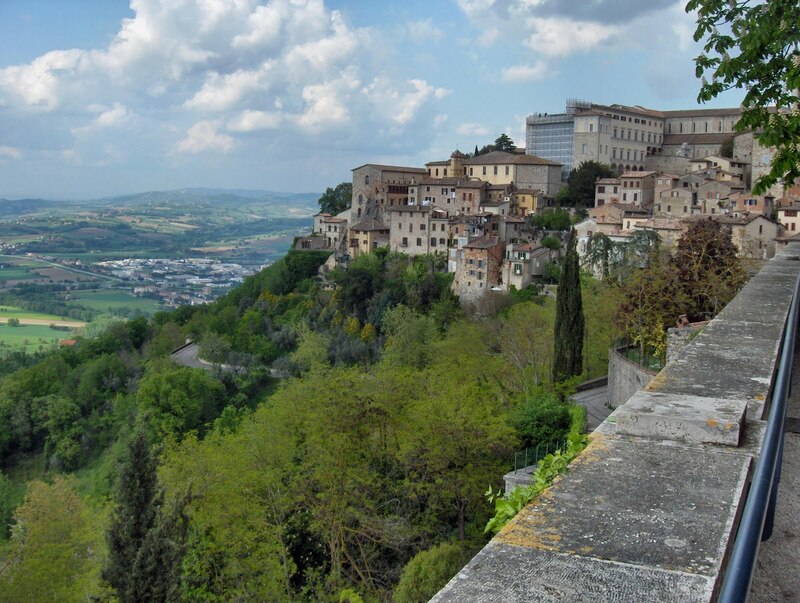 Bordering the well positioned town are Spoleto, Perugia, Orvieto, Assisi, Montepulciano, and Cortona. Assisi to me was the most impressive, with its massive stone walls rising up out of the fields. Driving up towards it, one is overcome by its sheer size and scope. Montepuliciano personally fostered the best wines of the region, and Corona was a joy to visit to see where the book “Under the Tuscan Sun” was based. Spoleto was a near rival to Todi in the absolute comfort that one feels walking around the main square. It is easy to lose yourself in the city, relaxing and soaking it all in. You won’t be sorry if you find time to visit Spoleto as it is a quick day-trip from Todi. Todi is also geographically perfect as it is close to halfway between Rome and Sienna/Florence. At a meandering pace, it is a great spot to take a load off while travelling from one of the big cities to another. The lifestyle is a little slower in the smaller hill towns, and you may want to leave your watch at home. The pictures are worth a thousand words, and are ultimately… priceless. You will treasure the memories that you create in this fabulous Umbrian town forever.